Jim is a native Californian, born and raised in Stockton, attending local schools and graduated from A.A. Stag High School before attending Cal Poly in San Luis Obispo. He graduated with a BS in Industrial Engineering and went to work for PG&E in 1968. He received his Master’s in Business Administration in 1988 from Sat. Mary’s College in Moraga. 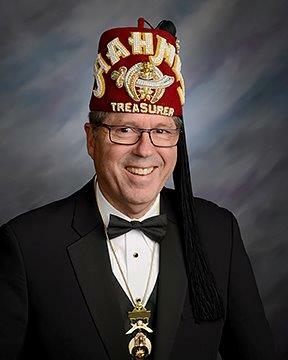 He became a Master Mason in 1991 and joined the Oakland Scottish Rite and Aahmes Shrine in 1992. He served as Temple Recorder in 2009 and was elected to Temple Treasurer in 2016. Jim has lived in Danville with his wife Cindy since 1979. He retired from PG&E in 2003 and has worked part-time at Wente Vineyards and Concannon Vineyards since 2004 as an Estate Ambassador.